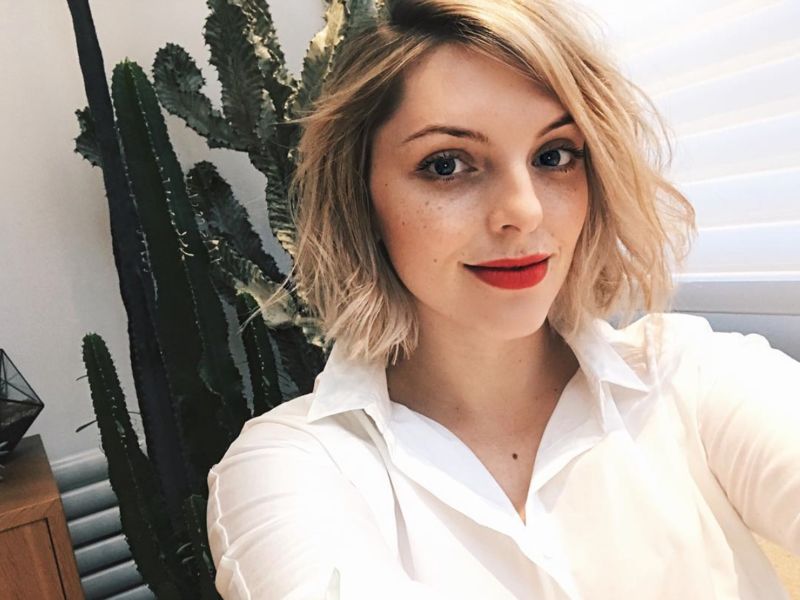 Estée Lalonde is on (well deserved) vacations. 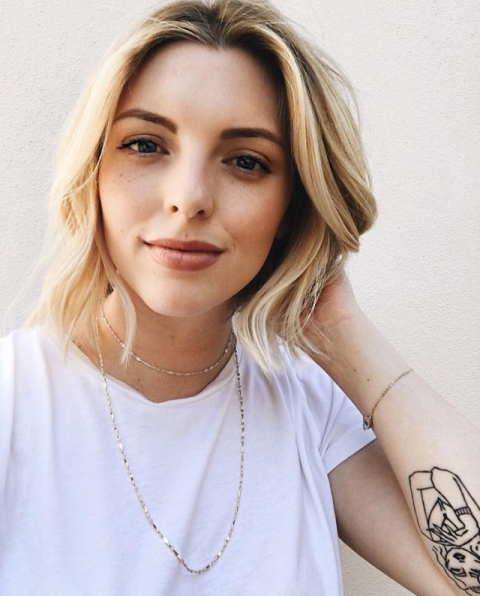 We managed to share her Beauty rituals and secrets, on the go. Follow along! What are your Beauty tricks to survive long flights? What do you always carry with you? I very rarely step onto a plane with a full face of makeup on because I find it very drying and uncomfortable. 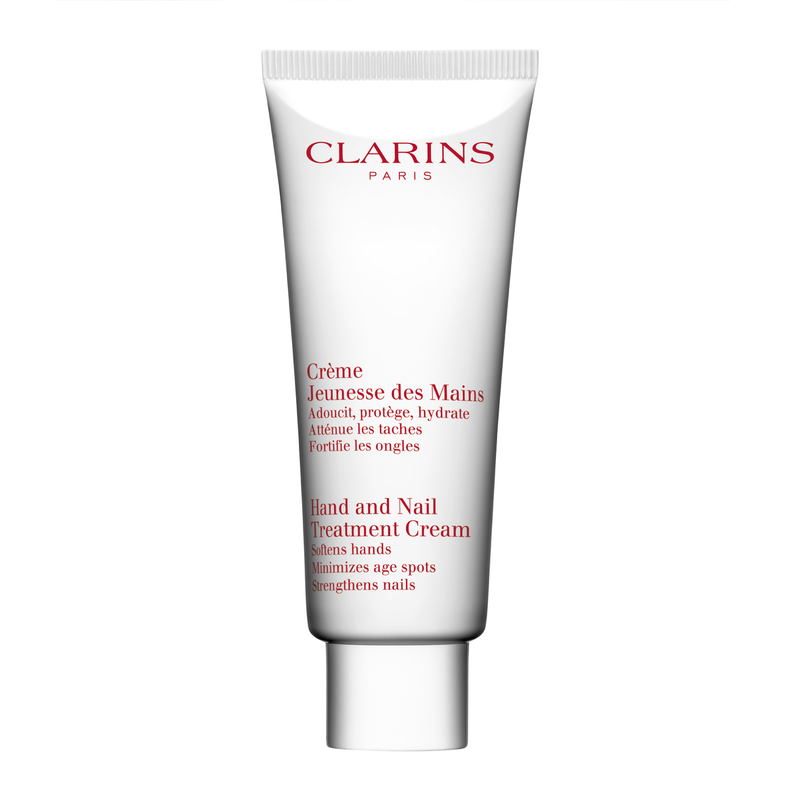 Whenever I’m travelling I’ll usually only pack the essential beauty products into my hand luggage; a skin essence for a boost of hydration whilst I’m in the air (Omorovicza Queen of Hungary Mist), my favourite lip balm (By Terry Baume De Rose Lip Balm), a hand cream (Clarins) and a face moisturiser (whichever one I have a tiny sample of!) and a sheet mask (Charlotte Tilbury Dry Sheet Mask). As for snacks, it’s become a tradition for me to grab a ginger shot right before I jump on the plane, alongside a big bottle of water and enough nibbles to get me through the duration of the flight. Headphones and a good book are also a must! What beauty rituals do you follow on a plane, treatments and makeup wise? I don’t wear makeup on a flight so I don’t really have any beauty rituals. 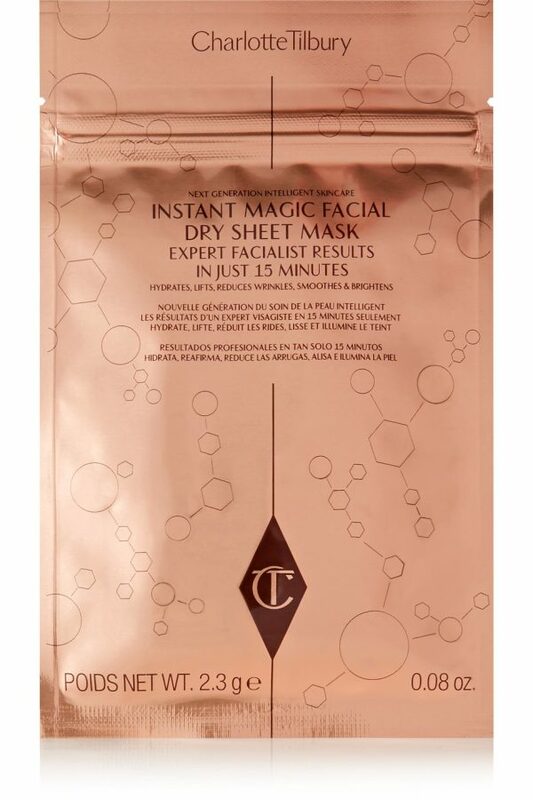 Something I do like to do however is apply one of my favourite Charlotte Tilbury ‘Instant Magic Facial’ Dry Sheet Masks. The reason I like to use a dry sheet mask is because there’s no mess and it’s so easy to apply. I tend to leave this mask on for around 15 – 30 minutes which leaves my skin feeling super hydrated and smooth. It also helps to brighten my skin so I’ll step off the plane looking a lot more awake than I actually feel. Bonus! How do you prepare for long flights? I’m so bad when it comes to preparing for long haul flights! Even though I try really hard to change my ways, I always find myself frantically throwing things into my suitcase the night before a flight. I tend to focus on packing my hand luggage before packing my suitcase; for me it’s most important to make sure that I have all my essentials with me in the cabin. I don’t know what I’d do if I forgot my book or my headphones! In general I’ve been learning to pack a bit lighter because I usually end up taking things that I don’t use. 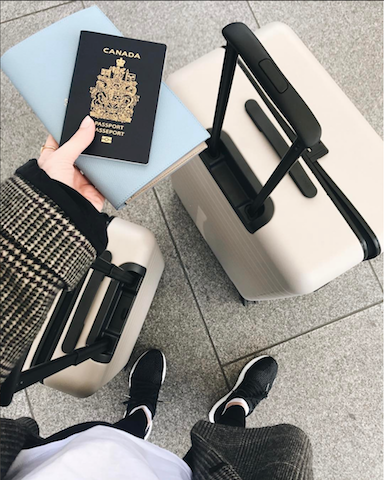 When you are going to be a long time away from home and your beauty products and routines, which products do you always take with you? Skincare is something that’s really important to me so if I have space in my suitcase to fit all of my favourite products then you can bet I’ll be bringing the whole squad. Cleansing my face in the evenings is something that I take great pleasure in doing and it actually helps to relax me after a long day of travelling. I suffer with dry skin so hydrating masks are something that I never travel without, especially if I’ve just stepped off of a long haul flight. 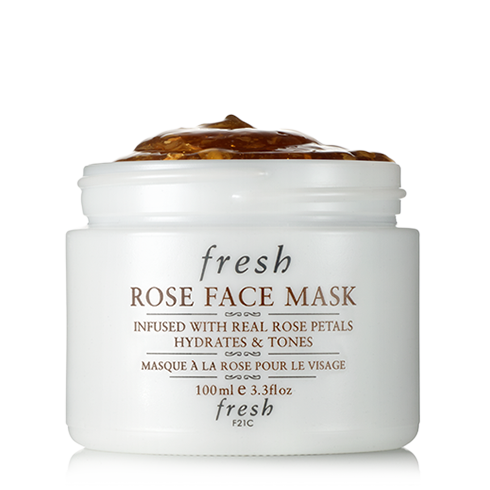 My ultimate favourite mask is the Fresh Rose Face Mask which actually has real rose petals in the formula and smells absolutely heavenly. This mask gives my skin the boost of moisture that it craves while I’m travelling and the scent helps to calm my senses. I love this stuff! What’s your favorite distraction or entertainment on board? I love to read so I usually have my nose stuck in a book for the duration of the journey. I don’t think I could make it through a flight without a good book to read, it helps me to relax, shut out my surroundings and keep me occupied. If I’m not reading then I’m probably asleep! I can fall asleep pretty much anywhere which is a trait of mine that comes in really handy while I’m up in the air! Do you do practice any sports or do some sort of exercise when you’re travelling? Lately I’ve been working really hard on sticking to a strict workout schedule when I’m at home, but sticking to a regimen whilst travelling is something that I struggle with. Travelling can be exhausting so I tend to listen to my body and let it rest whenever it needs some time out. That being said when I’m away on a work trip I like to try out different workout classes if I have some time to spare. When I was in Germany in the winter I took part in an epic spin class at the Adidas HQ and had the most amazing session! It’s cool to workout in a new environment and soak up the change in atmosphere, it makes working out feel like less of a chore and keeps things interesting. Do you take any supplements or vitamins when travelling? I’m so bad at remembering to take vitamins and supplements and I know that it’s something I should start doing since I always tend to get sick after a long haul flight! My Mom swears by taking Vitamin C every day and says that it helps to keep any germs at bay so maybe I should take a leaf out of her book. How do you stay in shape with so many hours of flying, changing routines and eating habits? In all honestly, I’m never going to be the kind of person who sticks to a strict workout routine when I’m travelling! If I’m away on a work trip I’ll try my best to make healthy food choices, but if I’m on vacation I like to let loose and treat myself to whatever my body is craving. Whenever I’m at home I try to make sure that I’m working out regularly and eating well, so no matter how many ice creams I’ve eaten at the beach, I know that I’ll always make the effort to concentrate on a healthy lifestyle when I get back from my trip. What’s your bag of choice when flying? 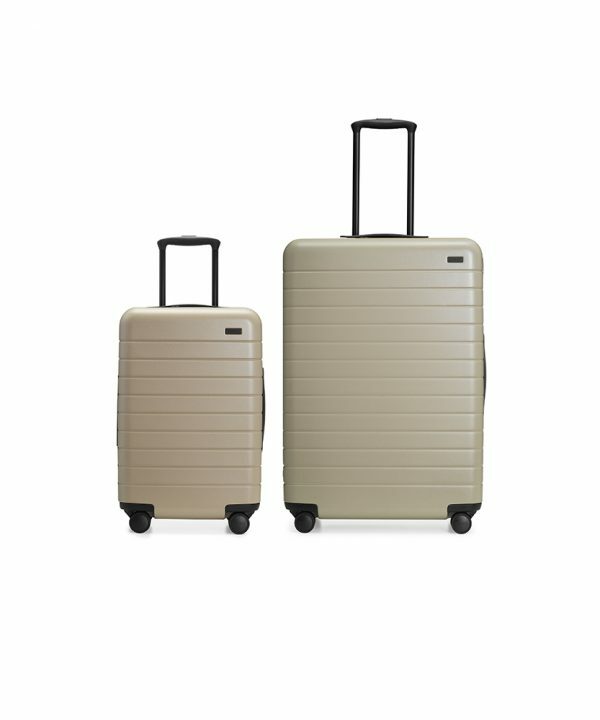 I recently got a gorgeous matching set of Away luggage and I’m in love! The cases move so easily and I can fit tons of stuff in there, not to mention that the sandy colour is absolutely gorgeous. 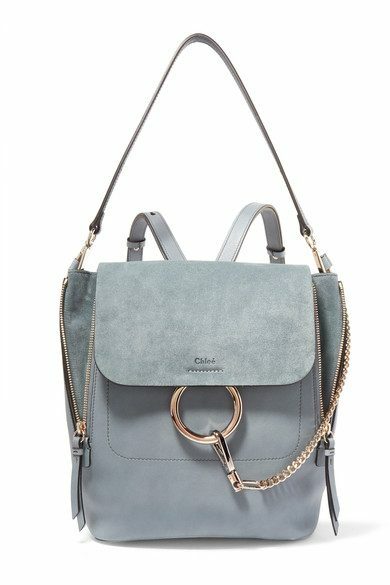 In terms of a handbag I don’t really have a go-to but I do love my dusty blue Chloé backpack, there’s so much space and I love being able to sling it over my shoulders. As long as I can fit my book in my handbag I’m happy. 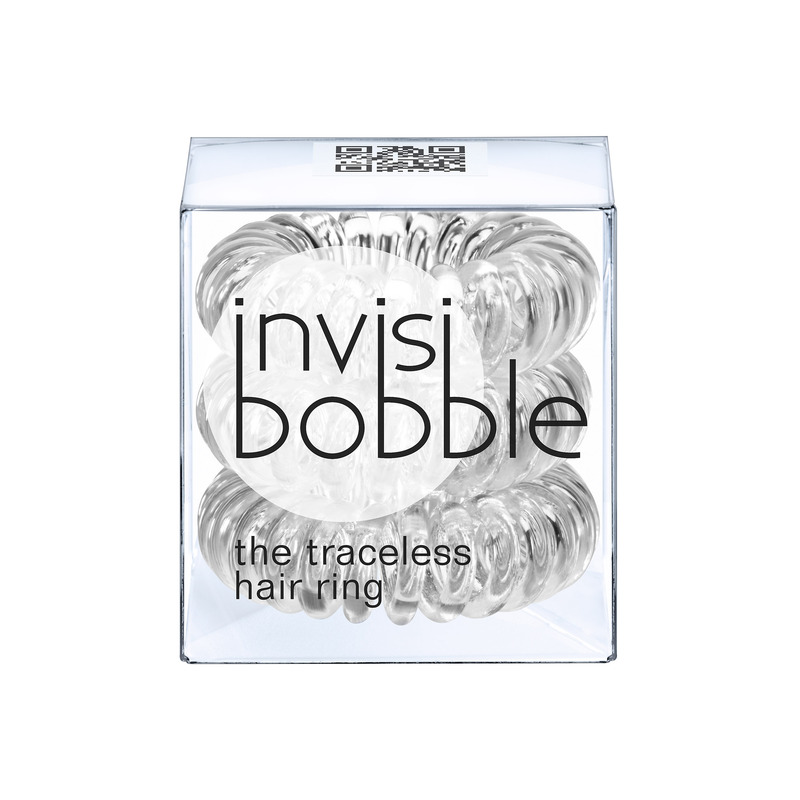 How do you take care of your hair when travelling? 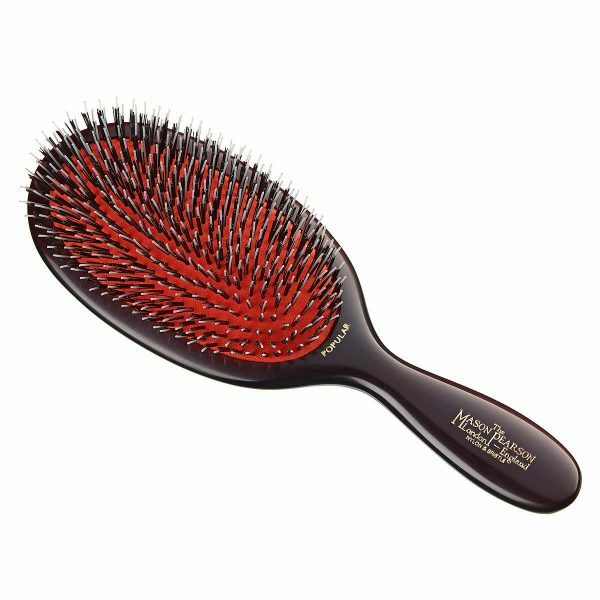 I don’t really have any specific travelling hair care tips, but for the past few months I’ve been taking the time to brush my hair with a Mason Pearson brush every evening before I go to bed. My hairdresser Larry King told me that brushing my hair in this way will help to distribute the oils to the ends of my tresses, thus making it healthier, stronger and more hydrated. Since doing so, I’ve really started to notice a positive difference to the condition of my hair. 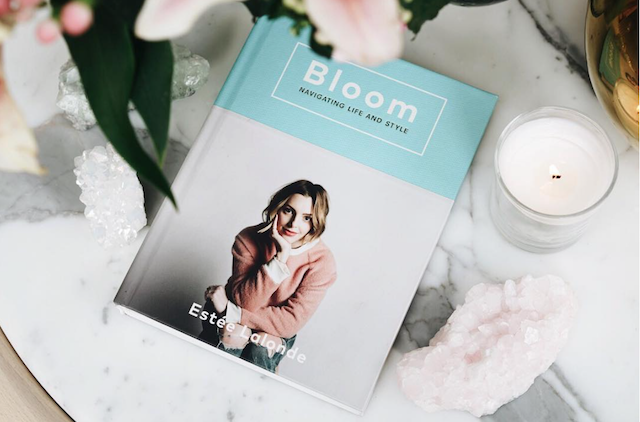 I can’t step onto a plane without a few hair ties in my handbag, a top knot is my go-to travelling hairstyle because it’s just so comfortable! I like to bring an eye mask with me to block the awful artificial lights in the cabin and help me get to sleep. My neck pillow is also something that stays with me at all times whenever I’m travelling, it helps to keep my back straight and my neck supported. I couldn’t doze off without it.I usually prepare some podcasts to listen to as well as a backup iPhone charger! Tell me about your latest projects, goals for this year? At the moment I’m actually recording my very own Podcast which is something that I’ve wanted to do for such a long time! I was super nervous to get started but I’m so pleased with how its coming along and all the hard work that myself and my team have put into this project is really starting to pay off. I can’t wait until the first episode is out there in the real world. This year I’ve also partnered with Lancôme which I’m super happy about, we have so many exciting projects coming up over the next few months so keep your eyes peeled for those. At the beginning of 2017 I also made it my mission to stop over-working. I’m one of those people who can’t switch my work brain off until my head hits the pillow so I’ve been trying to stop reading through my emails once 7pm rolls around. I’m slowly starting to learn the importance of taking time to switch off and enjoy the moment and that’s actually making me more creative in my work life. Quais os seus truques de Beleza para sobreviver a um voo longo? O que leva sempre consigo? É raro viajar demasiado maquilhada, porque sinto que a minha pele fica mais seca e desconfortável. Normalmente, sempre que vou numa viagem, só levo comigo os produtos de Beleza essenciais na mala de mão; uma essência de rosto para dar um boost de hidtatação enquanto estou no ar (utilizo o Omorovicza Queen of Hungary Mist), o meu bálsamo labial favorito (o By Terry Baume de Rose), um creme de mãos (da Clarins), um creme hidratante (qualquer um que tenha em tamanho de amostra) e uma sheet mask (levo a Dry Sheet Mask da Charlotte Tilbury). Quanto aos snacks, já e uma tradição para mim beber um shot de gengibre antes de entrar no avião, bem como uma garrafa de água e algumas dentadas em alguma coisa para me aguentar durante o voo. Nunca dispenso os meu headphones e um bom livro, são um must! Que rituais de Beleza tem no avião, no que toca a tratamentos e maquilhagem? Não uso maquilhagem durante o voo, e por isso também não tenho nenhum ritual de Beleza, por assim dizer. Uma coisa que gosto de fazer, apesar disso, é aplicar uma das minhas máscaras favoritas da Charlotte Tilbury, a Instant Magic Facial Dry Sheet Mask. Gosto de usar esta máscara porque é muito fácil de aplicar. Deixo-a atuar durante 15 a 30 minutos, pois sinto que deixa a minha pele mais hidratada e suave. Também ajuda a iluminar a pele, e assim saio do avião com um aspeto mais acordado do que aquele que realmente sinto. É um bónus! Como se prepara para um voo de longo curso? Sou terrível a preparar-me para voos longos! Apesar de tentar mudar isto, acabo sempre a atirar as coisas para dentro da mala na noite anterior ao voo. Tento arrumar sempre a minha bagagem de mão antes da mala de viagem porque, para mim, é mais imporante garantir que tenho todos os meus essenciais comigo na cabine. Não sei o que faria se percebesse que me tinha esquecido do meu livro ou dos meus headphones! Tenho feito o esforço de não levar tanta coisa comigo, porque acabo por pôr na mala coisas que não uso. Quando vai estar longe de casa e dos teus produtos e rotinas de Beleza, que produtos leva sempre consigo? Os cuidados de pele são muito importantes para mim, por isso, se tiver espaço na mala para todos os meus produtos favoritos, podes crer que os levo todos comigo. Limpar a pele ao final do dia é algo que me dá imenso prazer e que me ajuda a relaxar depois de um dia longo em viagem. Como a minha pele tem tendência a ficar seca, nunca viajo sem uma máscara de hidratação, especialmente se tiver acabado de sair de um voo longo. A minha favorita é a Rose Face Mask da Fresh, que tem pétalas de rosa verdadeiras na sua fórmula e um aroma absolutamente incrível. Esta máscara dá à minha pele o impulso de hidratação que precisa quando está a viajar, e o aroma ajuda-me a ficar mais calma. Adoro-a! Qual é a sua distração favorita durante um voo? Adoro ler, e geralmente tenho os olhos postos num livro, durante o voo. Acho que não conseguia sobreviver sem um bom livro para ler – ajuda-me a relaxar, esquecer o que me rodeia e mantêm-me ocupada. Se não estou a ler, é provável que esteja a dormir! Consigo adormecer em quase qualquer lado, e é uma característica muito útil quando estou a bordo! Pratica algum tipo de desporto ou faz exercício em viagem? Ultimamente tenho-me empenhado em seguir rigorosamente um plano de treino quando estou em casa, mas manter esse regime enquanto viajo é algo mais complicado. Viajar é cansativo e por isso acabo por dar ouvidos ao meu corpo e deixá-lo descansar quando precisa. Quando estou fora numa viagem de trabalho gosto de experimentar diferentes tipos de aulas se tiver tempo para isso. Quando estive na Alemanha, no inverno, participei numa aula de spin fantástica nos HQ da Adidas, foi uma sessão incrível! É bom fazer exercício num ambiente novo e aproveitar todas essas diferenças, porque são elas que nos ajudam a manter o treino interessante, em vez de sentirmos que é uma obrigação. Toma algum tipo de suplementos ou vitaminas enquanto viaja? Sou terrível a lembrar-me de que tenho que tomar suplementos e vitaminas, e é algo que devia fazer porque acabo sempre doente quando estou numa viagem mais longa! A minha mãe toma Vitamina C todos os dias e diz que ajuda a manter os germes bem longe. Acho que devia aprender com ela! Como mantém a forma com tantas horas no ar, mudança de rotinas e hábitos alimentares? Para ser honesta, acho que nunca vou ser o tipo de pessoa que consegue manter uma rotina restrita enquanto está a viajar! Se estou fora numa viagem de trabalho faço o esforço por comer bem e de forma saudável, mas se estou de férias, acabo por me deixar ir e comer aquilo que o meu corpo precisa. Quando estou em casa tento sempre garantir que estou a exercitar de forma regular e a comer bem porque, assim, apesar de todos os gelados que comer na praia, sei que quando voltar a casa vou sempre fazer o esforço e concentrar-me em fazer escolhas saudáveis. Que tipo de mala ou bagagem usa quando viaja? Recentemente comprei um conjunto de bagagem da Away pelo qual estou apaixonada! As malas movimentam-se muito facilmente e consigo levar imensas coisas dentr delas, para não falar que o tom areia é absolutamente lindo. Em termos de mala de mão, não tenho propriamente uma favorita, mas adoro a minha mochila em tom azul velho da Chloé. Tem imenso espaço e gosto do facto de a poder meter com facilidade nos ombros. Desde que a mala que leve tenha espaço para um livro, estou bem! Que cuidados tem com o cabelo quando viaja? Não tenho nenhum truque específico mas, nos últimos meses, tenho tirado tempo para escovar o meu cabelo com a minha escova Mason Pearson todas as noites antes de me deitar. O meu cabeleireiro, Larry King, disse-me que escovar assim o cabelo ajuda a distrubuir os óleos pelo comprimento do cabelo, fazendo com que fique mais saudável, forte e hidratado. Desde que faço isto, tenho notado uma diferença positiva no aspeto do meu cabelo. Que outros produtos/essenciais leva consigo? Não consigo entrar no avião sem uns quantos elásticos de cabelo na mala. Faço um apanhado “top knot” sempre que estou a viajar porque é muito confortável! Gosto de levar uma máscara para os olhos para ajudar a bloquear as luzes artificiais do avião e ajudar-me a dormir. Tenho sempre comigo a minha almofada para o pescoço enquanto viajo, porque ajuda-me a manter uma postura correta e suporta o meu pescoço. Não conseguia adormecer sem ela. Para além disso, preparo sempre uns podcasts para ouvir, bem como um carregador de iPhone a mais. Conta-me mais sobre os teus últimos projetos/planos para este verão/ano. Estou a gravar o meu próprio Podcast, que é algo que sempre quis fazer! Estava muito nervosa por começar, mas estou radiante com o resultado e todo o trabalho e esforço que eu e a minha equipa dedicámos a este projeto está a dar os seus frutos. Mal posso esperar por lançar o primeiro episódio! Este ano também fiquei muito feliz por me juntar à Lancôme. Temos imensos projetos novos para os próximos meses, por isso fiquem atentas. No início deste ano, prometi a mim mesma que ia deixar de me sobrecarregar com o trabalho. Sou o tipo de pessoa que não consegue abstrair-se do trabalho até deitar a cabeça na almofada, por isso estou a tentar parar de ler emails assim que são sete da tarde. Estou a aprender gradualmente a importância de tirar tempo para mim e aproveitar o momento, e é algo que me está a tornar numa pessoa mais criativa na minha vida profissional.